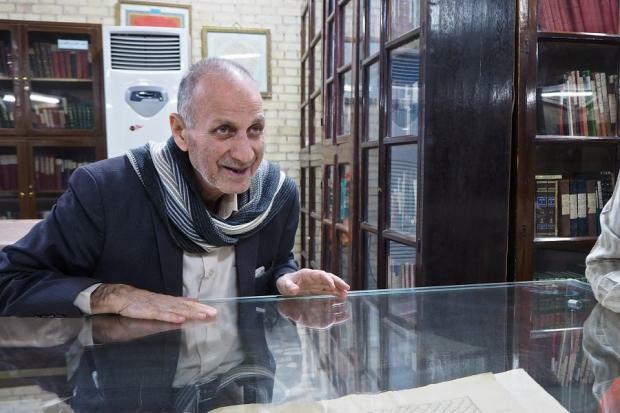 BAGHDAD – Librarian Abdulsalem Abdulkareem moves softly between the bookshelves of the al-Qadiriyya library, sliding silky fabric covers from glass exhibition cases to proudly reveal some of the collection’s most beautiful historic tomes. Many of these are richly decorated copies of the Quran, such as a two-volume hand-written edition, the pages of which are almost a metre long, gifted to the library from the Taj Mahal by an Indian prince several hundred years ago. 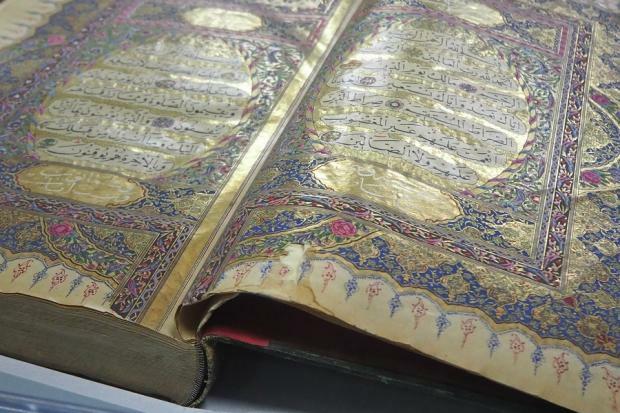 “Here we have something very special and the only one of its kind,” says Abdulkareem, revealing another Quran, its intricately patterned borders entwined with colourful flowers, and richly embellished with gold leaf. Several hundred years old, the book was a gift from the mother of a Turkish Sultan named Abdul Aziz. 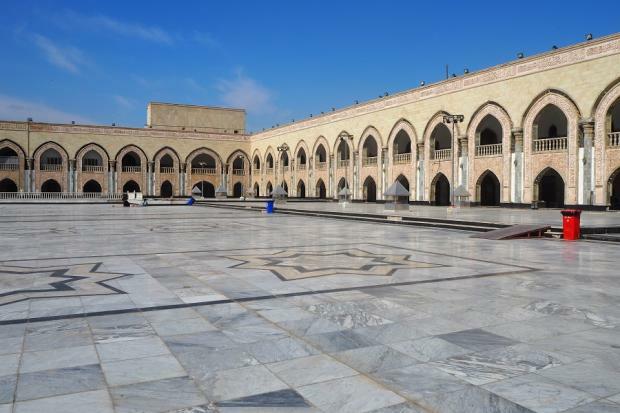 The library is tucked into one corner of the vast and beautiful mosque complex which houses the shrine of Sheikh Abd al-Qadir al-Jilani, an 11th-century Persian scholar who lived most of his adult life in Baghdad and was the founder of the al-Qadiriyya Sufi order. One of the most fascinating exhibits is a battered and stained 13th-century text that survived the ransacking of Baghdad in 1258 by Mongol general Hulegu, Genghis Khan’s grandson, which left 800,000 people dead. This book, along with the Qadiriyya Library’s entire collection, also escaped widespread destruction and looting of Baghdad’s libraries in 2003 following the US-led invasion of Iraq. Ten libraries were destroyed in Baghdad alone, and the loss of many valuable book collections was an event which the director general of the Iraq National Library and Archive in Baghdad, Dr Saad Eskander, later described as a “national disaster beyond imagination”. “This was the only library that did not get attacked because God protected it and because all our staff and volunteers – just ordinary people, not police or security guards, stayed here to protect it,” the third most senior cleric at the mosque, Sheikh Abdulrahman, tells MEE. He has sat beside Jilani’s tomb since 1974, welcoming visitors, answering questions and receiving prayer requests by telephone from devotees all over the world. “The Americans came here and spoke to us and we explained that we were just poor people here, with our shrine and religious things and we had only two Kalashnikovs for security, and they let us keep those and went away,” he explains. Terrified that the Qadiriyya collection could also be targeted while Baghdad’s other libraries were being looted and set ablaze, head librarian Abdulmajid Mohamed spent an entire day with other staff members carefully stashing all the most precious volumes in the basement and sealing it closed, even while gunfire echoed out across the capital. “I finished at 10pm and when I left here, the streets were completely deserted because it was a lawless time when everyone was terrified, and there were no taxis, so I walked home,” he says. “But it was worth the risk because we had to protect the books.” After hiding the books, staff welded closed all the library doors except one. The complex, today surrounded by high cement barriers and guarded by military police, also survived a 2007 car bomb attack with minimal damage and comparatively few civilian casualties, despite being located in a bustling downtown area. But it was again threatened in 2014 in a speech made by Islamic State (IS) leader Abu Bakr al-Baghdadi. He declared IS militants would “demolish tombs of Hussein ibn Ali in Karbala and Abdul Qadir jilani in Baghdad,” which he called “centres of polytheism” for Sufis and Shia. “We didn’t feel good when the so-called IS said this, but we were not worried because we have such strong faith in God,” says Sheikh Abdulrahman, rising from his chair near Jilani’s tomb to greet a group of Pakistani pilgrims carrying a richly embroidered red velvet cloth for a blessing at the shrine. “They said they were Muslims, but we have been here for many hundreds of years representing Muslims and Islam, and just look at the result today. We are still here, and where is the so-called IS now?” he adds. 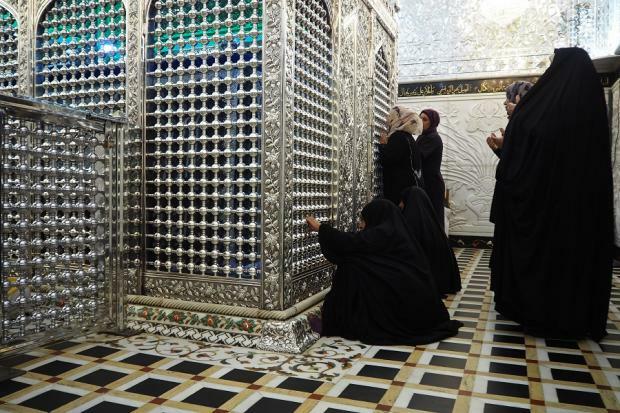 According to shrine volunteers, Jilani’s tomb is visited by many Iraqis and hundreds of pilgrims every day, both Sunni and Shia, from as far afield as Pakistan and Mauritania. They also say that they regularly receive Christian visitors, the occasional Hindu and one Buddhist who visits the shrine every year. Yet few of these modern pilgrims take notice of the library, which library staff say has existed for almost 1,000 years, even though Jilani’s own manuscripts formed the basis of the original collection. The library depends on revenue from land and properties it owns nearby, as well as donations. Throughout the centuries, devotees to Jilani have donated books to the library. The gifts still continue to this day. 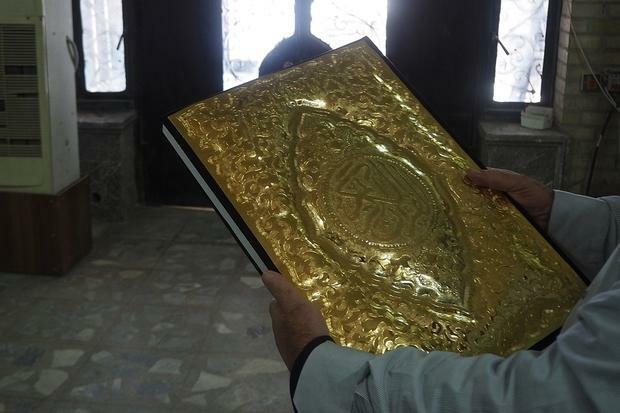 In a special padlocked cabinet near the entrance is a Quran with a finely embossed golden cover, a gift from a devotee in Syria which was presented to the library 10 years ago. 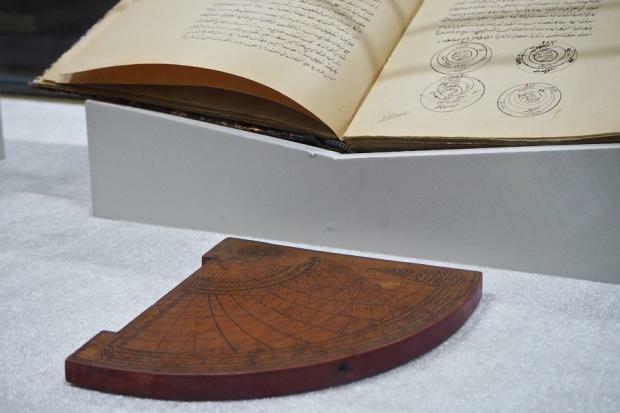 Although many of the library’s most revered books are historic copies of the Quran, it also holds many valuable early scientific texts and manuscripts, and its oldest tome is a 950-year-old work on Arabic linguistics. Small groups of students studying at the mosque’s madrassa take lessons in Islamic studies and Arabic calligraphy at long tables decorated with colourful displays of imitation flowers. And a female direct descendant of Jilani, Nora, now studying for her PhD in London, spends one month every year here studying manuscripts. But the desks in the Qadiriyya Library often stand empty. The many students, researchers and professors from universities across Iraq it had attracted for hundreds of years have dwindled with the rise of the internet. Despite the modest number of visitors, library staff continue to keep the interior pristine and the arched doors open five days a week. And, touchingly, they have just created a new display of 100 years of Iraqi newspapers on the upper floor. They are always striving to quietly improve what they can offer, even if there are few visitors to actually appreciate it. Abdulkareem admits that encouraging visitors to visit the library is not the main priority at the Jilani shrine complex, the focus of which remains very much on fulfilling its religious duties of welcoming pilgrims and providing for the local poor. The mosque’s kitchens feed hundreds of families every day. Nevertheless, library staff remain quietly optimistic about the future with hopes for more visitors and greater, perhaps even international, recognition of the collection they care for. 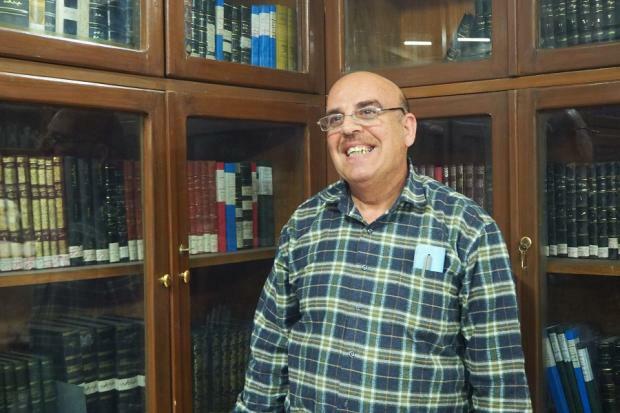 As well as its rare books, Abdulkareem estimates the library holds between 80,000 and 85,000 books, and it is believed to now be one of Baghdad’s largest after so much was lost in 2003. “We would love to have contact with other libraries around the world, but we are not very up-to-date with things here,” Abdulkareem says softly. This article is available in French on http://www.middleeasteye.net/in-depth/features/where-books-weren-t-burned-baghdad-s-secret-library-334560080Middle East Eye French edition.